Sometimes you get a day like this one. One that give you the warm and fuzzies from the pit of your stomach to your finger tips. Just brilliant. Today was spot on. 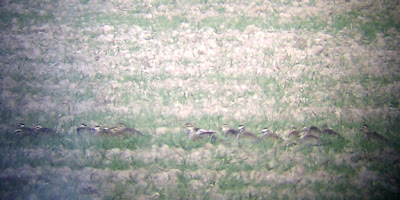 The Patch threw up quality birds and mammals and an atmosphere to revel in. I'd left the camera at home and walked in, so naturally there was tonnes that I could have captured in JPEGs but missed out on. This post is therefore illustrated with the warm and fuzzy images I could record via the mobile phone jammed up to telescope eyepiece. Rubbish photos for you to browse, I have the real, high res images saved in my head where they'll live long in the memory. As I drifted along the Wirral Way towards the office I pass no less than 8 singing Chiffchaffs. I manage to arrive at my destination free of droppings (see post from Monday 20th) and add 2 male Blackcaps to the warbler list too. A good start! Stoats are probably on the patch in reasonable numbers but are always elusive. In nearly 12 years watching the patch I've only ever seen 3. Number 4 arrived today. Darting with lightning pace along the hedgerow stopping to peer at passers by who didn't seem to notice this mustelid treat zipping about. Bonus! The air is still and warm, coat and jumper are discarded. The sun's rays permeate through the body, warming flowing blood and bones. The warm and fuzzies are kicking in. This day is awesome. On to the fields past the old campsite, and it's here that we encounter the only crimp in our day. 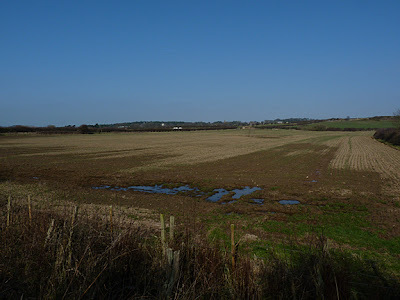 That enemy of British wildlife, the modern farmer, has done the dirty on the Lapwings of First Field and ploughed the field. Despite this they are still displaying, but the birds that had started to sit on nest scrapes will have to start over. Shelter Field is quiet. A majestic male Pheasant struts from the hedgerow lazily pecking at the ground. A White Wagtail is bobbing around the pond. A male Teal glows in the sun. A Grey Heron towers over them both. No signs of Wheatear. Exhibition Field is next. It doesn't disappoint. On the far fence 2 Red-legged Partridge are ambling along. Everything today is ambling, including Dee Birder. It's that kind of atmosphere. Pleasant. A bland word, but it aptly describes a day that is anything but bland. Thoroughly pleasnat. Scope is deployed to scan the sprouting crops. A big lump of cley grabs my attention. As I examine the brown blob it flaps an ear at a passing fly. It's nose twitches. An eye opens and catches the afternoon sun. A Brown Hare in its form. Good spot! It's camoflague is quite brilliant, it settles back down and melts into the cley to become a nondescript lump again. 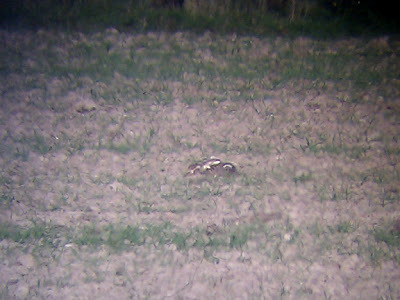 Look closely at the picture below, it really is a Brown Hare! Continuing to draw the scope across the field a couple of Stock Doves pass through the viewfinder. 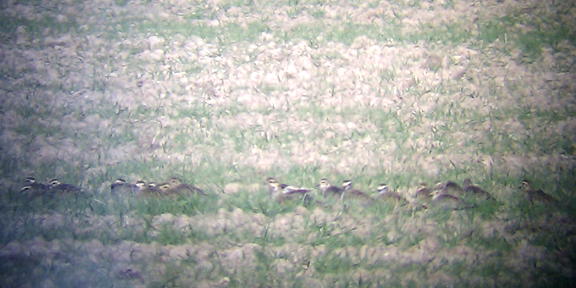 In a furrow about 50 Golden Plovers are crouched. Eyestripes are shining, dazzling in the sun. Plumage is starting to turn, the males looking tropical in gold dress. Black belly patches are starting to form. Stunning. Overhead a Skylark decides this scene needs a soundtrack and starts singing. Altogether a fantastic day. 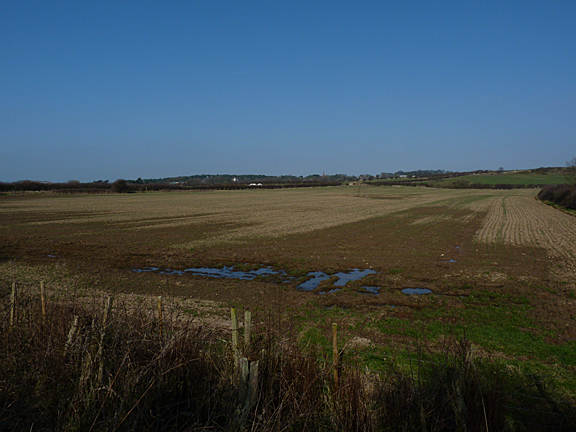 The pictures aren't up to much but I just had to try for a record of a wonderful day on the Patch.